Domestic waste disposal is an issue that is important to the management of any urban area. Cities without a functioning waste-disposal plan face risks of disease running rampant and economic activity grinding to a halt. 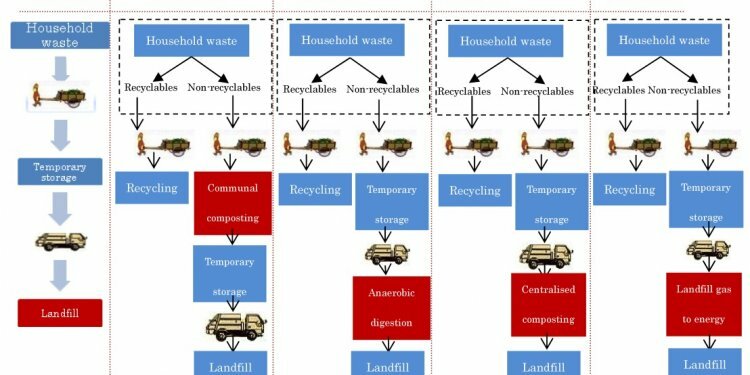 The majority of North American cities use the sanitary-landfill method of waste disposal, which has served fairly well for quite a while; however, in situations where space is at a premium, incineration and material-recycling-based waste disposal are more likely to come to the forefront. The modern sanitary landfill is much more than a simple dumping ground, due to the fact that waste materials are handled in a more controlled fashion to preserve the quality of groundwater in the area. Lighter materials are placed at the bottom of the sanitary landfill, which contains the majority of toxic compounds, thereby protecting the local environment. According to the University of Michigan's website, after each day's new waste is added, a new layer of soil is added to cover the waste in the hopes that it will break down before the landfill's barrier between the waste and the groundwater breaks down. Sanitary landfills require continuous maintenance and treatment of wastewater as well as the recovery of toxic gases, making them potentially hazardous if left derelict long enough to allow systems to fail. The main flaw of the sanitary landfill concept is that it continually consumes both land and resources to contain the waste, in addition to being potentially ecologically damaging. Landfills could also stifle the growth of a city, due to the fact that they are usually constructed at present city limits without accounting for potential growth and land-use needs. No one is going to want to buy property on or near a landfill, making the landfill itself and the surrounding area a proverbial no man's land. Incineration is a popular garbage-disposal method in locations where space is at a premium or in locations where there is no sanitation service provided by local government. Although incineration can provide relief from dealing with the bulk of material waste, it does not entirely eliminate problems. Anything in the burning incinerator that contains a toxic substance, particularly heavy-metal toxic substances, will be sent up the chimney and cast as ash all over the surrounding area. The toxins from the burning of waste then build up in the local populace, contributing to a variety of health problems ranging from asthma to heavy-metal poisoning and even cancer. Proponents of incineration disposal point out that energy can be obtained from the burning of waste materials; however, the health costs quite likely offset any potential gains from burning unsorted waste materials. Incineration coupled with proper waste sorting can be effective in reasonably safe measures, as long as the materials being burned are only simple organic waste and not manufactured goods. Material-recovery sorting takes the concept of recycling to a whole new level, wherein the entirety of the city's waste is sorted by material specifications, and as much of it is recovered for reprocessing as possible. Although at first glance such a project can seem daunting, tedious and expensive, it is possible for the opposite to be true. Modern advances in robotic and automated technology can allow the waste to be sorted without direct human contact, and the recovered materials can be sold for profit, thus helping to keep the system sustainable and potentially economically beneficial. Materials found in municipal waste such as aluminum, steel, copper, plastics and others are in high demand for current industrial production, making a large-scale sorting of waste for recycling purposes that much more viable.